It is the first time that this company, which has been in the news more frequently in the last few years than almost any publicly traded company, has opened its books for investors, journalists and curiosity seekers. Unlike Lyft, which has kept its focus on the US and Canadian markets, Uber's ambitions have been more global, though reality has put a crimp on some of its expansion plans. 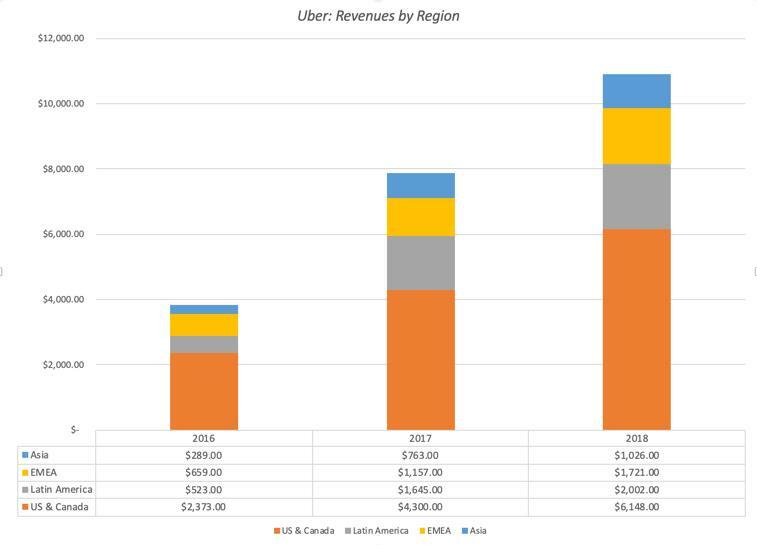 Uber does not provide a breakdown of profitability by geographical region, but the magnitude of the losses that they wrote off when they closed their Chinese and South East Asian operations suggests that the US remains their most lucrative ride-sharing market, in terms of profitability. After Lyft's (NASDAQ:LYFT) IPO on March 29, 2019, it was only a matter of time before Uber (UBER) threw its hat in the public market ring, and on Friday, April 12, 2019, the company filed its prospectus. It is the first time that this company, which has been in the news more frequently in the last few years than almost any publicly traded company, has opened its books for investors, journalists and curiosity seekers. As someone who has valued Uber with the tidbits of information that have hitherto been available about the company, mostly leaked and unofficial, I was interested in seeing how much my perspective would change, when confronted with a fuller accounting of its performance. To get a sense of where Uber stands now, just ahead of its IPO, I started with the prospectus, which weighing in at 285 pages, not counting appendices, and filled with pages of details, can be daunting. It is a testimonial to how information disclosure requirements have had the perverse consequence of making the disclosures useless, by drowning investors in data and meaningless legalese. I know that there are many who have latched on to the statement that "we may not achieve profitability" that Uber makes in the prospectus (on page 27) as an indication of its worthlessness, but I view it more as evidence that lawyers should never be allowed to write about investing risk. 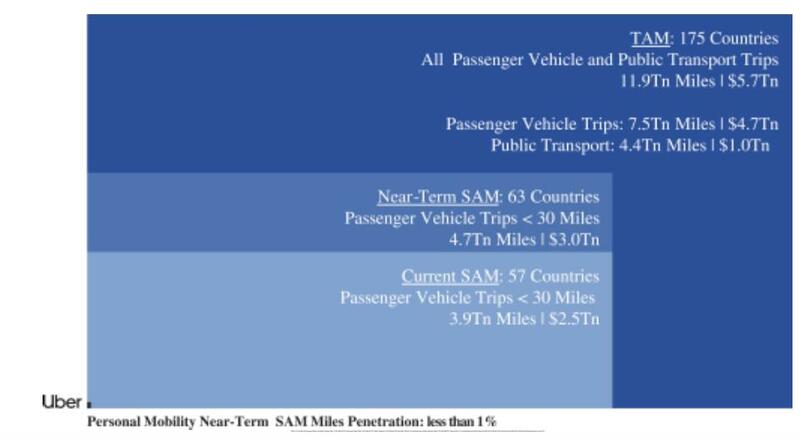 While the cynic in me pushes me back on this over reach (I am surprised that they did not include the calories burnt by the most common transportation mode on the face of the earth, which is walking from point A to point B, as part of the total market), I understand why both Lyft and Uber have to relabel themselves as more than car service companies. Big market stories generally yield higher valuation and pricing than small market stories! The adjusted EBITDA column contains numbers estimated and reported for the company, with a list of adjustments they made to even bigger losses to arrive at the reported values. I convert this adjusted EBITDA to an operating income (loss) by first netting out depreciation and amortization (for obvious reasons) and then reversing the company's attempt to add back stock based compensation. The company is clearly a money loser, but if there is anything positive that can be extracted from this table, it is that the losses are decreasing as a percent of sales, over time. I make some assumptions here which will play out in the valuation that you will see below. User Acquisition costs: Using the assumption that user change over a year can be attributed to selling expenses during the year, I computed the user acquisition cost each year by dividing the selling expenses by the number of riders added during the year. Operating Expenses for Existing Rides: I have included the cost of revenues (not including depreciation) and operations and support as expenses associated with current riders. Corporate Expenses; These are expenses that I assume are general expenses, not directly related to either servicing existing users or acquiring new ones and I include R&D, G&A and depreciation in this grouping. The good news is that the expenses associated with servicing existing users have been decreasing, as a percent of revenues, indicating that not all of these costs are variable or at least directly linked to more rider usage. Also, corporate expenses are showing evidence of economies of scale, decreasing as a percent of revenues. The bad news is that the cost of acquiring new users has been increasing, at least over this time period, suggesting that the ride-sharing market is maturing or that competition is picking up for riders. While it is clear that Uber's ride-sharing customers have been quick to adopt Uber Eats, there are subtle differences in the economics of the two businesses that will play out in future profitability, especially if Uber Eats continues to grow at a disproportionate rate. In valuing Lyft, I used a top-down approach, starting with US transportation services as my total accessible market and working down through market share, margins and reinvestment to derive a value of $13.9 billion for its operating assets and $16.4 billion with the IPO proceeds counted in. Using a similar approach is trickier for Uber, since its decision to be in multiple parts of the logistics business and its global ambitions require assessment of a global logistics market, a challenge. I did an initial assessment of Uber, using a much larger total market and arrived at a value of $44.4 billion for its operating assets, but adding the portions of Didi, Grab and Yandex Taxi pushed this number up to $55.3 billion. Adding the cash balance on hand as well as the IPO proceeds that will remain in the firm (rumored to be $9 billion), before subtracting out debt yields a value for equity of about $61.7 billion. The share count is still hazy (as the multiple blank areas in the prospectus indicate) but starting with the 903.6 million shares of common stock that will result from the conversion of redeemable convertible preferred shares at the time of the IPO, and adding in additional shares that will result from option exercises, RSUs (restricted stock units issued to employees) and new shares being issued to raise approximately $10 billion in proceeds, I arrive at a value per share of about $54/share, though that the updated version of the prospectus, which should come out with the offering price, should allow for more precision on the share count. This approach yields a value for the equity of about $58.6 billion for Uber's equity, which again depending on the share count would translate into a share price of $51/share. There are two ways that you can read this table. 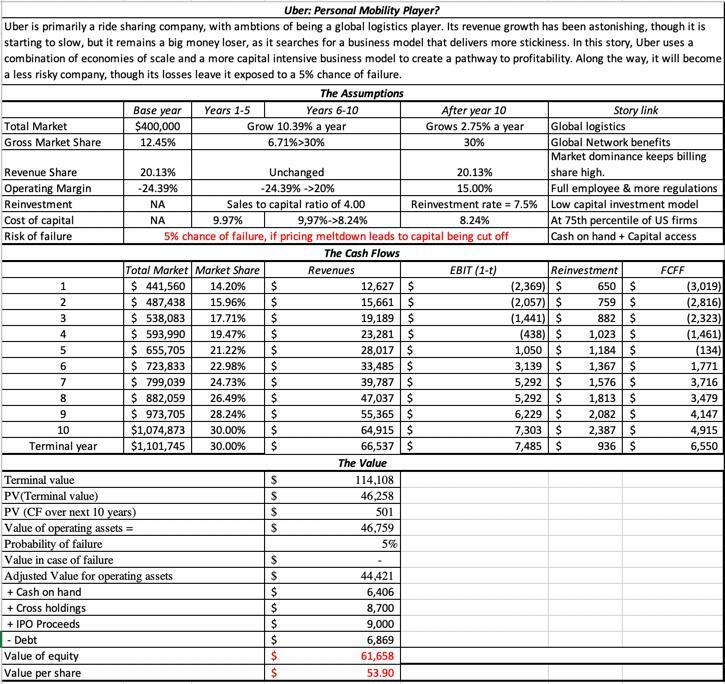 If you are a trader, deeply suspicious of intrinsic value, you may look at this table as confirmation that intrinsic value models can be used to deliver whatever value you want them to, and your suspicions would be well founded. I am a believer in value and I see this table in a different light. First, I view it as a reminder that my estimate of value is just mine, based on my story and inputs, and that there are others with different stories for the company that may explain why they would pay much more or much less than I would for the company. 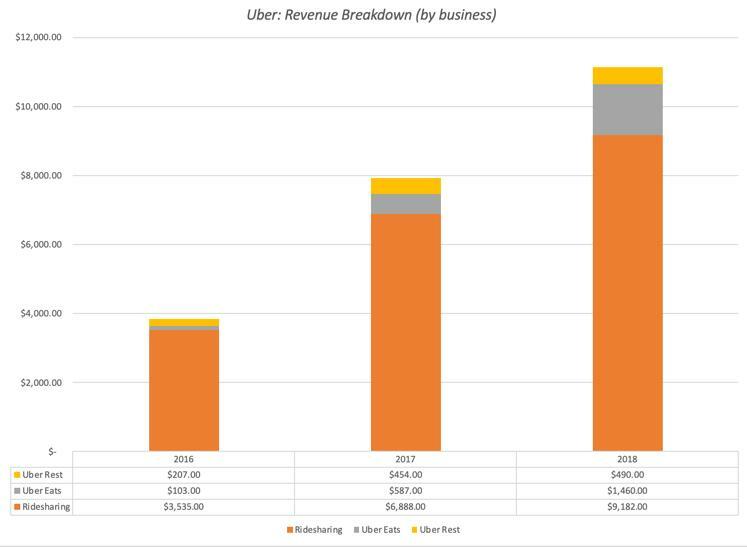 Second, this table suggests to me that Uber is a company that is poised on a knife's edge. If it just continues to just add to its rider count, but pushes up its cost of acquiring riders as it goes along, and existing riders do not increase the usage of the service, its value implodes. If it can get riders to significantly increase usage (either in the form of more rides or other add on services), it can find a way to justify a value that exceeds $100 billion. Third, the table also indicates that if Uber has to pick between spending money on acquiring more riders or getting existing riders to buy more of its services, the latter provides a much bigger bang for the buck than the former. Put simply, I hope Dara Khoshrowshahi means it when he says that Uber has to show a pathway to profitability, but I think that is what is more critical is that he acts on those words. In my view, this remains a business, whether you define it to be ride-sharing, transportation services or personal mobility, without a business model that can generate sustained profits, precisely because the existing model was designed to deliver exponential growth and little else, and Uber, and the other players in this game), have only a limited window to fix it. In computing Uber's equity value from its enterprise value, I have added the cash ($6.4 billion of cash on hand plus the $9 billion in expected IPO proceeds) $ and Uber's cross holdings ($8.7 billion) to the value and netted out debt ($6.5 billion). To get the value per share, I have used the estimated 1175 million shares that I believe will be outstanding, including options and RSUs, after the offering. Depending on the metric that I can scale it to, you can get values ranging from $47 billion to $124 billion for Uber's equity, though each comes with a catch. If you believe that there are no games that are played with pricing, you should think again! Also, as Lyft's price moves, so will Uber's, and I am sure that there are many at Uber (and its investment banks) who are hoping and praying that Lyft's stock does not have many more days like last Thursday, before the Uber IPO hits the market. I am sure that there are many who understand the ride-sharing business much better than I do, and see obvious limitations and pitfalls in my valuations of both Uber and Lyft. In fact, I have been wrong before on Uber, as Bill Gurley (who knows more about Uber than I ever will) publicly pointed out, and I am sure that I will be wrong again. I hope that even if you disagree with me on my numbers, the spreadsheets that are linked are flexible enough for you to take your stories about these companies to arrive at your value judgments.